Longevity is a curious entity in today’s constantly changing world. On the one hand it suggests staying power and a certain resilience to shifts in trends and opinion. On the other it might smack of intransigence and the hint that one is still hanging around long after the high watermark of success, achievement and even notoriety has passed. For filmmaker Oliver Stone the former certainly transcends the latter, and his particular brand of longevity is all the more remarkable for a director so deeply immersed within the industry’s rituals and proclivities, and yet so steadfast in his refusal to conveniently play the accepted game. But the latter view of what an extended career means still ruminates in the mind of someone even as famous and immediately recognisable as Stone. When we interviewed him for this book, Stone told us a story about a conversation he had backstage at the Oscars in 1990. He had just won his second Best Director Academy Award for Born on the Fourth of July and a very famous luminary sidled up and in effect told him to enjoy the moment because it won’t ever come round again. At the time, Stone thought it was sour grapes and a somewhat embarrassing put-down of his skills and talent. But, as the years went by, the brief exchange came to mean much more. “Only later,” he confided, “do you really see the moment when you hit that high watermark, not knowing it will soon pass.” Nevertheless what he hoped for, and what that brief exchange taught him, is that a body of work can and will sustain; not just one film, not one moment or even one period that might encapsulate a contribution to the art of motion pictures. Stone from the very beginning sought a career that could be taken in its entirety and thus dissected, understood and, yes, appreciated as a collective body of work. So when we started research on this book in 2011 we knew that body of work wasn’t complete and were aware that we weren’t writing the definitive finale of Oliver Stone’s career. Five years later that position is even truer now than it was then. Nevertheless we also knew in 2011 that there had not been a significant book on Stone’s life and career in over fifteen years. So, in our own modest way, we were embarking on a project that was going to be the first to examine what we term Stone’s “second half” career. But in order to give any credence to what he had been doing since roughly the turn of the millennium, we also knew that we had to take stock of the ‘first half’ of Stone’s professional life. To do that we felt we couldn’t simply analyse him film-by-film, working our way from past to present. Neither could we envision a process that simply lined up films next to each other – Wall Street and its sequel, Nixon and W. or U Turn and Savages say – which would be to fall into far too easily conceived binary comparisons that didn’t do justice to the films, nor to the concerns he had in making these movies. Instead we opted to look at key descriptors; nouns that didn’t just allow us to pigeonhole films into obvious definitions related to their subject matter or plots, but instead suggested something of Stone’s ambitions and ideology throughout his career. While Corporations, Love, Money and Politics were all equally important then in this structure we implemented, there was a good reason we started with War, as the extract from Chapter one below demonstrates. Nothing defines Oliver Stone quite like war; its conduct, repercussions, personal cost, and its aftermath. For the most important, argumentative and vital political filmmaker of the last thirty years, it seemed the most obvious and salient way to begin. By any standard, Oliver Stone has been a product of war: intrigued by it, physically and psychologically marked by it, propelled to action by it, and galvanised in opposition to it. The world he grew up in – a post- war America that conspired against communism abroad, and ran scared of its shadow at home – was forged in the call to war that newspaper editor Henry Luce entreated Americans to embrace in his 1941 article, ‘The American Century’. In noting that the twentieth century was America’s moment of maturation, Luce suggested that the country was already the intellectual, scientific and artistic capital of the world. Within the hyperbole also lay the threads of an American foreign policy that, from the end of the Second World War, would have such a profound effect on the baby boomer generation to which Oliver Stone belonged. Luce’s philosophy emerged in key policy statements such as the Truman Doctrine and more generally in the hot wars against communism, not least Vietnam. Stone’s early life and career were dominated by the effects of Vietnam. Much later with Nixon (1995), he was still piecing together his personal and cinematic treatise on what the country and the conflict meant to himself and his fellow Americans – and his work has returned to that territory and its wider Cold War ramifications time and again. However, there has been a shift in his career as time has moved on. His post- 9/ 11 films, Alexander (2004), World Trade Center (2006), W. (2008) and Savages (2012) also had plenty to say about war, but for the most part they said it in a more understated manner. It has been left to Stone’s emerging documentary work in the 2000s to air his forthrightness. The ambitious ten- hour series, The Untold History of the United States which aired in 2012-13 challenged conventional Cold War history and emphasised themes and facts which Stone and his co-writer Peter Kuznick believed had been excised or downplayed in a host of studies of the twentieth century. The themes of empire and perpetual war were important reference points in this reassessment and as a project Untold History was nothing less than a repudiation of Luce’s prophetic analysis of the US in the later twentieth century. Despite the vehemence of his repudiations however, Stone’s public declarations and cinematic position on war and empire have never simply aspired to isolationism. He is not a pacifist. He does not advocate disengagement from the threat of international terrorism in the modern age; but he does see the US administration’s tendency towards militaristic solutions as ultimately self- defeating. Its intelligence gathering, as events in the 2010s gave testimony to, covered an ever- increasing multitude of confusing sins, much of these encapsulated in Stone’s latest film, Snowden (2016). Of course, his history as a decorated combat veteran looms large in his politics and attitude to conflict and it is easily forgotten that this has made him a difficult target for critics who normally would lambast their adversary for a pretender’s ignorance in such matters. With Stone, his military record cannot even begin to entertain such criticism. Neither boastful nor contrite about this past, he has used it to construct a critique of foreign policy that no one else in Hollywood could come close to emulating. Indeed, war is the central mantra of almost all that Stone does, in his films and life. The battle to craft images and meaning is no easier, or less challenging, than it was when he started making films, and his dogged application to the task belies nothing less than a personality forged in war. Off-set, his perspective has also been affected more than any other filmmaker by a society long geared for conflict: a country that has come to know war almost as an extension of its being, from the Cold War to the ‘War on Terror’. Why that should be so has been Stone’s rallying call from the moment he stepped back on American soil from Vietnam in November 1968, became the defining mantra of his films in the 1980s and ‘90s; and has become an increasingly urgent question for him in the years since 9/ 11. 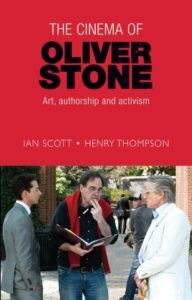 Blog readers qualify for a special 20% off the paperback edition of The cinema of Oliver Stone, if orders are placed on our website. Simply add OTH739 at the checkout to receive the discount. Offer ends 31/12/2016. Category: Blog, Cinema, Film & Media	0 Comments.